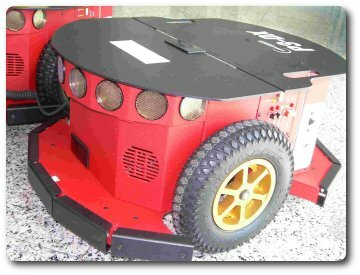 I-Guide is an autonomous tour robot for the Electrical and Computer Engineering Department at Bradley University. This tour robot gives audio and visual feedback to visitors concerning the various labs, classrooms, and faculty members. The tour robot utilizes a topological decomposition map in conjunction with a barcode reader for localization and uses the Pioneer 3 as the base platform. Special thanks to Northrop Grumman for providing financial support to our project. Overall this project was a success. The final progress of this project, while not where we wanted it to be, was still sufficient enough to accomplished many of our original goals. The final product of this project was a robot which could navigate down a hallway, identify barcodes located on the ceiling, and avoid obstacles. The only localization that was implemented was the second floor of Jobst Hall at Bradley University. We accomplished implementing an infrared sensor ring on top of the Pioneer 3 platform as well as mounting a monitor, which was not utilized in this project. Also, we were able to integrate an Analog to Digital to USB converter with our software to be used for data logging and implement a barcode scanner to be used for locating barcodes, which are placed on the ceiling. Please, feel free to navigate our site and enjoy our photo / video gallery. For more detailed information regarding this project, read our final report, which was published and presented at the 2009 Florida Conference on Recent Advances in Robotics (FCRAR) and can be located on this site here. If you have any further questions or comments, please, email either Joe Buckner or Nir Chezrony. Copyright © 2009 I-Guide. All Rights Reserved.